To promote the specific interests of ship suppliers in the European Union, ISSA, the International Ship Supply and Services Association (ISSA), created a special European ship supply committee in 1976, which began operations under the name of O.C.E.A.N, short for the French title: “Organisation de la Communauté Européenne des Avitailleurs de Navires”. This felt as necessary in view of the new regulations being formed by the EEC authorities concerning ship supply. With the exception of Luxemburg, all Member States of the EEC were important maritime nations. The first task of O.C.E.A.N. was to study and discuss the drafts of an EEC regulation laying down the customs procedure for the supply of stores to vessels, aircraft and international trains. A first revision appeared in 1976 and was followed by further revisions. The O.C.E.A.N. 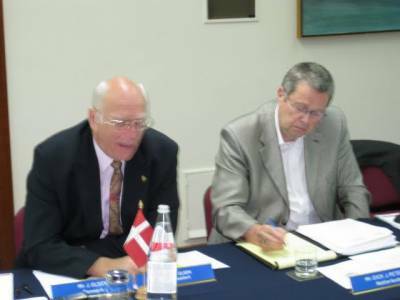 committee recommended various alterations due to practicalities on ship supply. Since then, O.C.E.A.N. has actively been following the work of the European institutions, publishing the document “Ship Supply Export Trade moving into 1993”, at the beginning of the Single Market. O.C.E.A.N. was renamed in November 2008 as “OCEAN – European Ship Suppliers Organization” as the voice of the ship supply industry of Europe towards the European institutions and European governments.